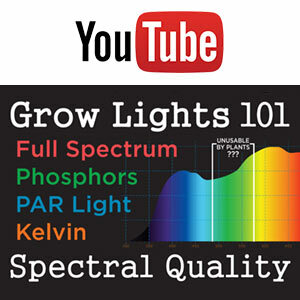 "LEDs are so much more efficient than other grow lights." "LEDs don't generate heat." "You can place your plants super close to LEDs without the plants getting burned." "LED lights are cheap and don't live up to the hype." "Good LED systems are super expensive and not worth the money." Have you ever heard any of these sentiments? Each of these statements might seem very true. Or they may not apply what-so-ever to your situation. Sorting through countless product pages of LED grow lights has become a very complex process. Sometimes it feels like a mine field of overpriced or underwhelming products. What sort of LED grow system should you select? Will it output sufficient light? Is it worth the money? Indoor gardening and seed starting solutions don't have the same requirements as growing weed, I mean... "medicinal herbs". A lot of LEDs are designed and optimized for big buds. But what about a small scale urban gardener who is on a tighter budget? The first thing to do is to make sure we have realistic expectations. Let's look at some labelling claims made by sellers that have left some consumers with a bad opinion of LED grow lights. Sellers will claim that LEDs have a rated life of 50,000 hours. Whatever you do, don't bank on this! Even if the actual light diode lasts for 50,000 hours, that doesn't mean all components on the board will hold up. My 1st SMD UFO light burned out within 2 years. After trying to fix it, I found that what had burned out was actually the diode next to the LED diode, not the LED light. The bottom line? If you are making a massive investment, only bank on these lights lasting for the duration of any warranty period offered. Any life you get beyond that should be considered a bonus. Over the years, manufacturers and sellers have been observing scenarios where lights burned out much faster than expected. Poor heat dissipation and high wattages have often been contributing factors. A common solution is to select LED bulbs that are rated to a higher capacity. Then they are driven with a reduced current. So, for example, a 3w bulb might only receive 1.8w of electricity. Thus, the LED is not pushed to the very limits of its capabilities. As a result, it is able to last longer. This engineering tactic has resulted in confusion as sellers are citing the maximum potential of the LED diodes used in the grow light. But many of them are not disclosing the actual watts of power that the light consumes. 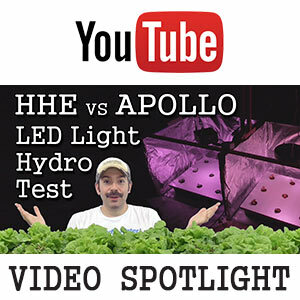 EFFICIENCY: I've seen much controversy surrounding the stated wattages of LED grow lights. 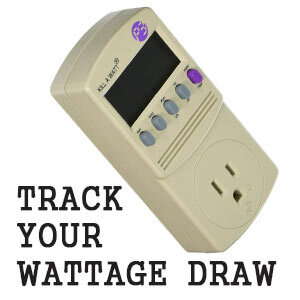 A wattage is a measurement of electrical energy consumed by a device. It measures power consumption -NOT power capacity or build quality. This is important because there is a direct correlation between electricity consumed and light produced. LEDs convert electrical energy into light through the emission of photons. More power means more photons which means brighter light. Efficiency describes how effective the light is at producing photons as opposed to generating heat. More efficiency means more light per watt. Not all LEDs are as efficient. But regardless, it takes a certain amount of power or wattage to make a certain amount of light. WATTAGE LABELLING: So when a light manufacturer states a wattage for their LED grow light, a consumer has a certain expectation of the amount of light produced. Overstating the wattage inflates a consumer's expectation and leads to disappointment. In reality, this is fraudulent labelling. It directly violates the FTC's definition of what a "watt" is and how it should be used on the product label of a light. This seller claims their light is 24w, but the light only draws 13w. Incandescent bulbs were highly inefficient. They consumed lots of power for only a little light. CFLs came along and were able to convert much more electricity into light. Thus you began to see labels on 26w CFLs that said "replaces 100w incandescent bulb". This was ok because it allowed for comparison shopping. Some LED makers will say "compares to 400w HID". Meanwhile, the LED only draws 200w. That's ok as long as an accurate comparison is being made. Even still, disclosing the ACTUAL wattage should be mandatory. LED CONFIGRUATION: In regards to build quality, an LED manufacturer might call a light "180w" because it is built from 60 LED diodes, rated at 3w each. So the LED configuration is 6x30w. Meanwhile, the light only runs at 60% capacity, consuming 109w. In this example, it is a 109w light -NOT a 180w light! Imagine running 60 x 5w LEDs at 1w per diode. A seller might presume to label such a light as "300w" but it would only draw 60w. And the light output would be much lower than expected. For this reason, all lights should list accurate wattage consumptions. To denote build quality, sellers could adopt a naming convention like 6x30w, but that should NEVER be used to designate the raw wattage for a light. Some LED grow lights don't consume the wattage you would rightly expect. Watch out for shady Amazon or Ebay light sellers who are over-inflating wattages. I've purchased a Kill A Watt light meter which I now use to verify each and every LED light that is sent to me. 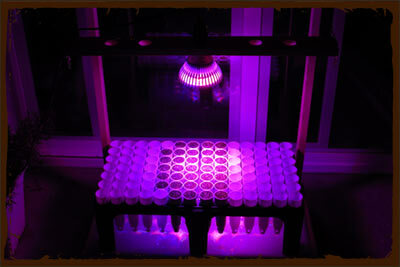 The low end LED lights which are inexpensive and seem good for seedlings are often the worst culprits. Many of these cheap solutions end up being a waste of money as they cannot come close to the performance of a basic T5 fluorescent grow-light system. This Amazon seller has given out free or nearly free LED lights to try to get 5 star reviews. Does an LED grow light seem too good to be true? Only $30, but it claims to cover a 10 foot diameter! You might think it's bogus, but then you look for the reviews. You see product photos along with photos showing great growth. And there are lots of 5 star reviews. Seems legit! But wait... Oh there it is. "I received this product at a discount in exchange for my honest and unbiased review." Yep, this seller has handed out some freebies to bribe people into writing positive feedback. These are people who just want free junk. They don't perform objective tests. IF the wattage is low and the seller doesn't have an actual website, steer clear of these sad excuses for grow lights! Once you know the actual wattage draw of your light, that enables you to accurately calculate the electrical costs of running that light. Check out the next page to tips on savings money with a more efficient light upgrade. I've even included a price calculator!